An Alternative Firstgear TPG Jacket. Firstgear quality has improved dramatically over the past several years. The Teton jacket and Escape pants are proof. The jacket has many useful features. 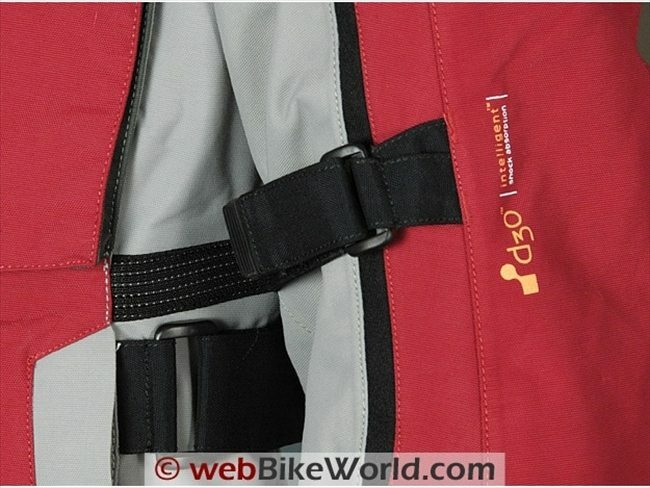 And with the optional Firstgear TPG “Basegear” layers and the included zip-out liner, this is a true all-around system. The liner is exceptionally comfortable and stylish and can be easily worn by itself, a bonus. (NOTE: This article has been revised since the original publication date, based on new information that was not available during the evaluation see below.) 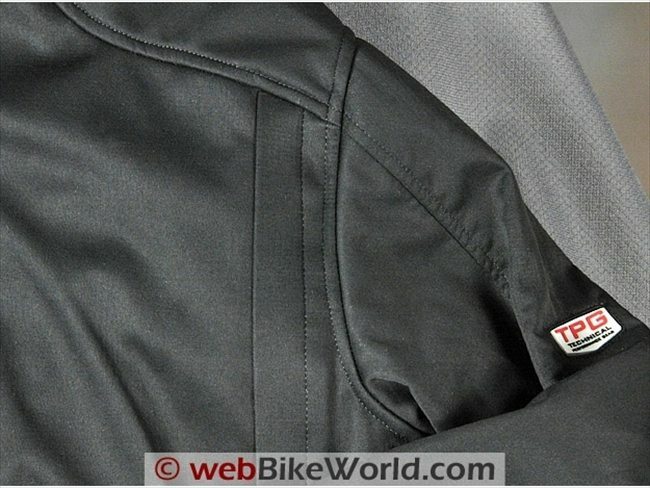 We reviewed the Firstgear Rainier TPG jacket in February of 2008. The Rainier was the first item of clothing to appear in what was then the new Firstgear TPG (Technical Performance Gear) line, which is their premier offering for all-season riding. When the TPG clothing line was first announced, it wasn’t clear if the Basegear was optional and this was reflected in our criticism of the Firstgear marketing effort for the TPG line. But as you can see in the quote above, and based on other explanations on the Firstgear website, the company now clearly explains which items are included and which are optional in TPG products, so that issue has been resolved. Unfortunately, we no longer have the Rainier jacket here for comparison; it was purchased by a reader in our webBikeWorld garage sale. But the new-for-2010 Teton jacket is a fine piece. And it’s a big evolution of the 2008 TPG gear and we are all definitely impressed by the level of quality and construction and Firstgear’s dedication to continuously improving the product line. I specifically chose the Teton short jacket for this review, along with the matching Firstgear TPG Escape pants. That’s because it’s a different take on the “classic” 3/4-length jacket and pants combinations that are commonly used for cold-weather riding. My hypothesis was that the shorter jacket would be more comfortable and would also be much more versatile in warm weather, making this a potential true four-season outfit. By the way, the Teton is identical to the 2009/2010 Firstgear Rainier jacket, other than the length. So the conclusions for both jackets should be the same. 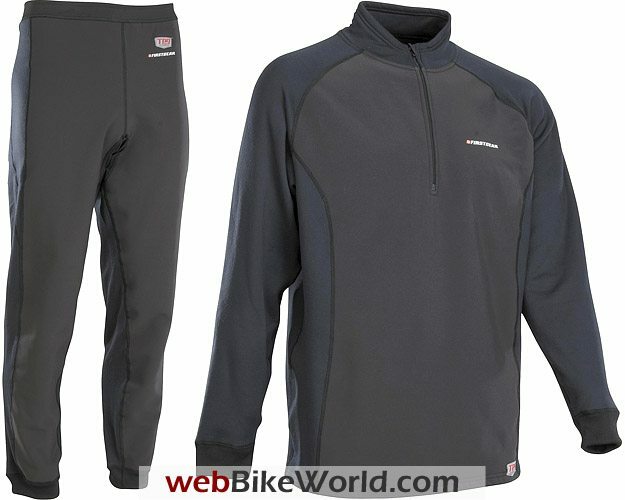 This time, we also have the optional Firstgear Basegear top and bottoms (pants). 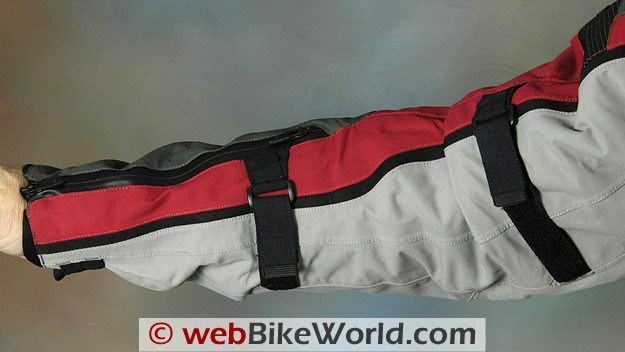 That turned out to be another excellent choice, as they too are high-quality items that are excellent at blocking wind and even some water while keeping the rider warm and dry. The Firstgear Basegear shirt and pants is available in both a winter and a “regular” version. This is the winter version, which features a long-sleeved top and long bottoms. Don’t think that you have to own a TPG outfit for the Basegear to work, because they are an excellent choice for wearing under any brand of motorcycle clothing. Although I’m sure Firstgear would rather you wear it under a TPG jacket and pants! The same goes for the Firstgear TPG Escape pants (described in this separate review), which were designed as a match for the TPG jackets but, as it turns out, would also make an excellent choice combined with other jacket brands. I was impressed by the Firstgear Teton jacket as soon as I pulled it out of the box. The combination of fabrics, design and construction have a “smooth” modern look with very nice styling and the fabric sections are perfectly cut, seamed and sewn. I quickly tore off the labels and put the jacket on, wearing only a cotton T-shirt and a long-sleeved Duofold undershirt that forms my usual base layers indoors and out during the cool months. The size large Teton jacket fits perfectly and it’s a correct snug fit, which is just as it should be. 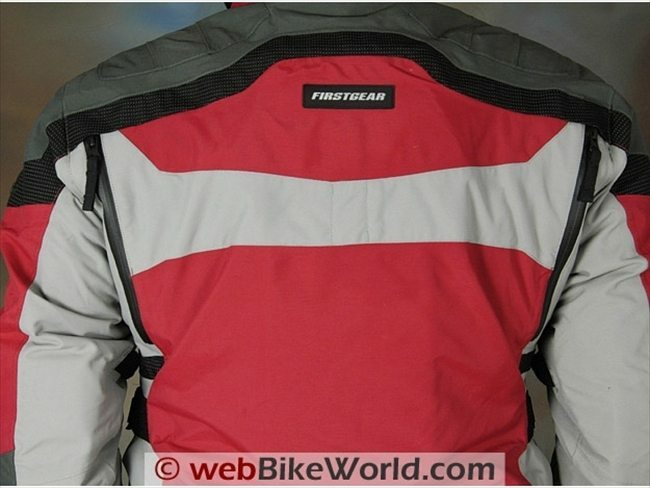 Firstgear says the size large should fit a 42-44″ US chest with a 36-38″ waist and 34.5-35″ sleeve length. I agree, although I think the jacket might be a touch too big on someone at the lower end of that size range. Motorcycle clothing manufacturers are doing themselves a disservice by using the term “waterproof”, which carries a specific meaning; i.e., impervious to water. “Water-resistant” is a better term, and how about some proof that the product was tested to meet standardized pressure testing schemes? Why not use the term “water resistant” instead? 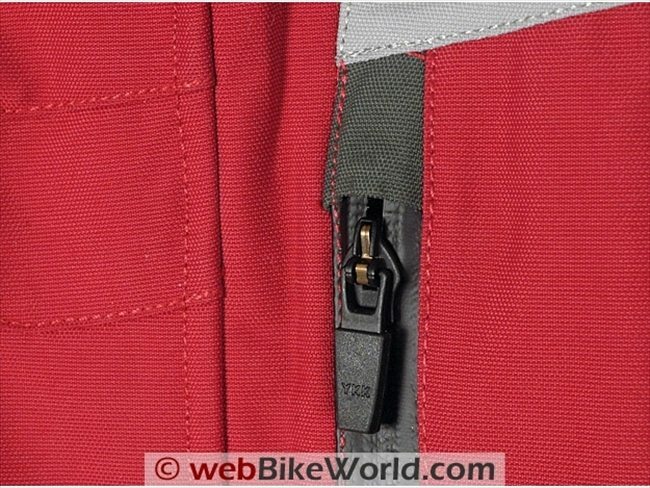 A motorcycle jacket has openings through the shell, including zippers, pockets, vents, etc., so it most likely never be 100% waterproof 100% of the time, and claiming so is misleading, as webBikeWorld readers have discovered. From now on, it’s “water-resistant” to us and we suggest that motorcycle manufacturers do the same. By the way, any clothing can be made “waterproof” with the addition of an inexpensive one-piece vinyl rainsuit. Carry it in the tank bag and pop it on when it starts to rain. We’ve mentioned this before, but many motorcyclists wear clothes that are at least one size too big. 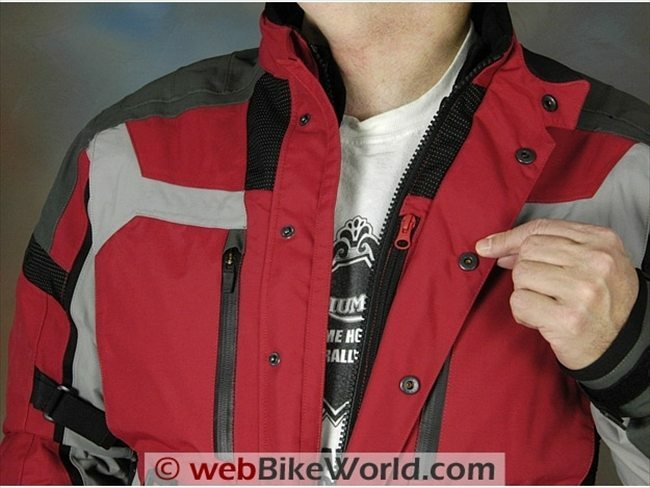 Motorcycle outer layers must fit more tightly than the loose street clothes that are in style. That’s because the snug fit helps to keep the armor and protective features in place so they can work. A snug fit also helps to keep out drafts! So the Firstgear Teton fits as it should. And the upside is that the jacket still fits correctly when the Tech Liner is removed, making the Teton useful for summer too. Starting at the top, the neck has a fleece lining and a hidden rainproof hood inside the collar. This does make the collar thicker than average, but so far it hasn’t interfered with any of the helmets I’ve been wearing. The collar only has one snap on the front and no adjustment, which is surprising. But it fits my 17.25″ neck and I think it would remain comfortable down to the neck sizes that would be proportional for this jacket size. The collar and the waist hem have the only two snap heads that are visible on the jacket. Each is coated with some type of semi-soft/semi-hard plastic. The rest of the buttons are hidden by the placket, as you can see in the photo below. The snaps used on the Teton jacket are high-quality metal spring snap buttons with matching metal receivers. They are stamped with a logo that reads “K.Y. 484 Brand”. A quick search for that brand turned up nothing on that company, but the snaps appear to be of good quality and the internal metal springs in this type of fastener are much better than the cheap plastic snaps found on many motorcycle jackets. The removable Tech Liner uses two separate zippers to attach to the inside of the front of the jacket, along with a snap loop at the collar and two at each cuff. The Teton jacket shell uses a thick zipper for the main closure. All of the zippers on the jacket are by YKK, including the water-resistant zippers on the front and back. [November 23, 2009: This is a correction to the original article. Firstgear just informed us that the zippers used in the front shoulder vents are RIRI brand “AQUAzip” zippers. Opening the zipper reveals an open weave mesh covering the opening. The vents line up with matching vertical openings in the Firstgear “Hypertex Plus” water-resistant and breathable shell. The shell is a relatively soft, finely-woven, 600 Denier nylon-type material with a permanent water-resistant liner bonded directly to the inside. The use of the RIRI AQUAzip zipper changes the landscape, because these are expensive items and this detail illustrates again the effort and thought that has gone into the jacket. Note that some motorcycle jackets depend on an internal (and sometimes removable) water-resistant liner, so the outside of the shell can become sodden while (hopefully) the inner water-resistant liner keeps the rider dry. The Teton shell itself acts as the water-resistant barrier, and the bonus of this type of system is that the water is mostly repelled when it hits the surface of the shell. Modern materials like the Firstgear Hypertex Plus have made this outer water repellency possible. In the past, a jacket shell could be made water-resistant, but this type of treatment would also hold in the moisture, making for a hot and sticky ride in any type of weather. I knew the Teton jacket does a good job at repelling water, based on our experience in wearing the jacket in our all-too-frequent rainstorms. But just to confirm how well the Hypertex Plus material resists water, I placed the jacket face up on a table, forming a large bowl-shaped area with the jacket shell. I then filled it with water. A couple of hours later, the water was still sitting there in a puddle, looking just like it would if the shell was made from rubber or plastic. When I drained the water, the outer shell fabric felt only the slightest bit damp and even this feeling disappeared within a minute or so. That’s about as “water resistant” as it gets! The removable Firstgear Tech Liner is supplied with the Teton jacket and it forms an integral part of the TPG system. Firstgear says the TPG system consists of the Basegear wind- and water-resistant underwear, the Tech Liner (which comes with all TPG jackets) and the jacket itself, or the “outer shell”. The Tech Liner is one excellent piece of gear and it can also easily be worn as a lightweight, wind-resistant jacket for street wear. 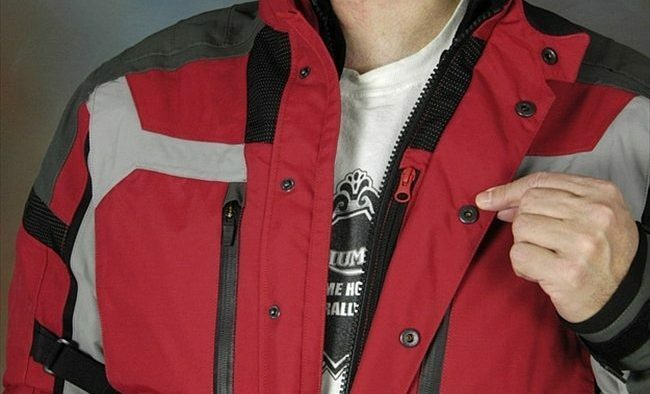 About the only feature that identifies it as a liner (and which would take a close inspection to discover), are the loops on the outside of the sleeves, which attach to the inside of the jacket. Just make sure these don’t get caught on something and get torn off, or you may not be able to re-attach the jacket to the Teton shell. This shouldn’t be a problem actually, as the loops are placed out of the way. Firstgear is now very clear about which items come with TPG clothing and which accessories are optional. Again, the Tech Liner comes with the jacket and it’s made from a triple-layer laminate water- and wind-resistant fabric that really works. 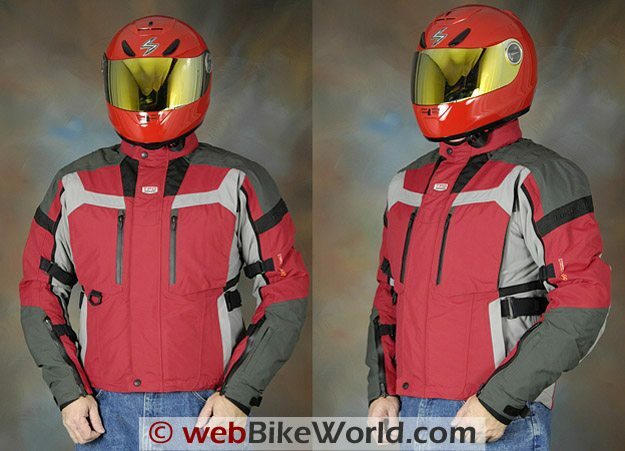 The Tech Liner is a very excellent garment that literally could be sold independent of the Teton jacket (but isn’t) and would be a valuable addition to any motorcyclist’s clothing collection. This does help justify some of the Teton’s list price. The liner is very comfortable, it looks great and it’s very well made with folded and bound seams. It has a mesh lining in front and fleece lining in the rear, water-resistant YKK zippers (including a horizontal zipper in the rear for attaching the Teton jacket to the Escape pants); taffeta sleeve lining and more. The combination of the Teton jacket shell and the Tech Liner works down to around 55 degrees or so (13 C), when the Basegear becomes necessary. The Teton shell with the Tech Liner does a good job at blocking the wind on my chest, but I can feel some cold air leaking through to my upper arms, although I’m not sure why. I’d suggest that in the wind-blocking fabric is continued down the front of the arms in the next version of the Basegear. Back-to-back rides wearing the Teton jacket with the Tech Liner installed and the Fieldsheer Aquasport recently reviewed, along with the upcoming Shift Triton jacket brought forth some interesting observations. The Teton breathes better than the others, but that breathability also seems to result in slightly more cold seeping through around the shoulders of the Teton compared to the other jackets. Firstgear Winter Basegear. The gray panels in front are wind- and water-resistant. Photos courtesy Firstgear. Combine the optional Firstgear Basegear (photo above) with the attached Tech Liner (included with the TPG jackets) and you have a very lightweight, very comfortable, thin and sleek outfit. 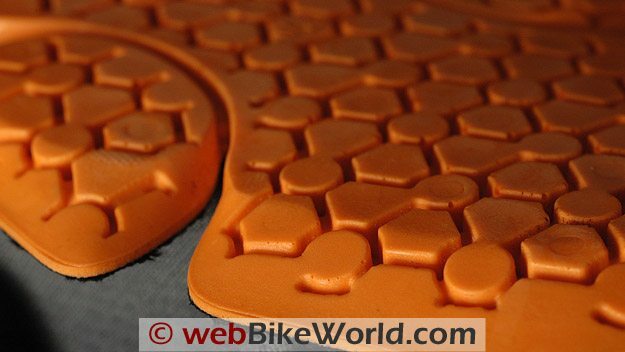 It can protect from the vast majority of riding conditions other than perhaps the opposite extremes of cold and heat, which call for specialty equipment anyway. The Basegear includes 7% Spandex — the wonder fabric — and a soft fleece lining to make for a very comfy base layer for cold-weather riding. The Basegear shirt and pants both feature wind- and water-resistant sections on the legs and chest. And combined with the Tech Liner and the Teton shell, this really is a system — all of my doubts from the original Firstgear Rainier jacket review have been laid to rest. The Basegear also uses a two-layer fabric, claimed to wick moisture and it works. The inner seams are flat stitched and the material has a very nice soft hand. Whether you own a Firstgear TPG outfit or not, I think the Basegear shirt and pants would be a worthy addition to your winter arsenal. The Teton has two water-resistant vertical zippers on the front of the chest, but these are pockets, not vents. The vents are semi-hidden, located behind fabric flaps on either side just at the edge of the chest and the arms, illustrated in the photo above. These outer vents use regular zippers with teeth, not water-resistant zippers, probably because of the protection afforded by the fabric cover over the zipper. The Tech Liner has matching vertical vents in the same location, positioned to fall under the Teton jacket’s side vents. The Tech Liner vent cover flap opens inwards, towards the chest, so the liner uses the water-resistant YKK zippers to protect this area. Opening the Tech Liner vents involves taking off the Teton jacket, lowering the liner attachment zipper and then lowering the liner vent zipper. My suggestion is to open all the zippers in the liner unless it’s raining and some extra water resistance is required. 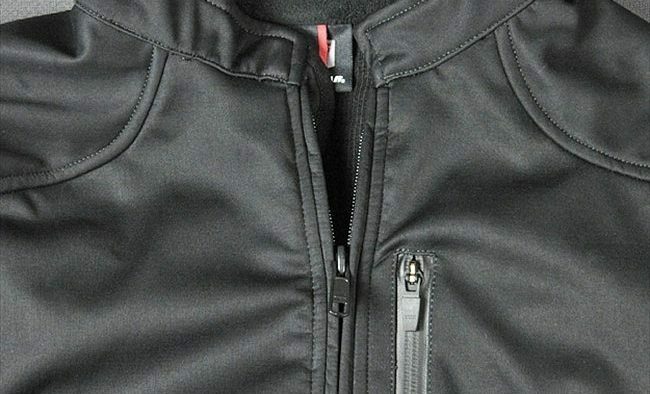 The side vents on the Teton jacket have large zipper pulls, which make it easy to open the vents while riding. (See the updated note on the use of RIRI AQUAzip zippers, above). When the vents are opened, a cord with a holder is uncovered. I assume this is designed to hold the vent open, but they don’t seem to work on this jacket; pull on the cord and secure it with the spring-loaded holder and…nothing happens. Oh well — not really necessary anyway, as I’ve never really found any of these vent holder-openers to work anyway. The inner water-resistant liner has a matching opening for the vent. The Teton shell and its water-resistant liner does indeed provide good protection from relatively thick downpours. For the 0.001% of motorcycle riders who actually do ride long distances for many hours in extreme downpours, neither the Teton nor any other motorcycle jacket made by any manufacturer will likely keep you 100% dry. If you really want to be completely waterproof in extreme conditions, you’ll probably need a completely waterproof rainsuit (see the sidebar discussion). The only other vents on the Teton jacket are located on the back. There are two vertical vents with water-resistant YKK zippers. The vertical orientation is good, as it should allow most water that hits the closed zippers to quickly run down and off the zipper opening. I noticed no water ingress whatsoever through these vents when they are closed. 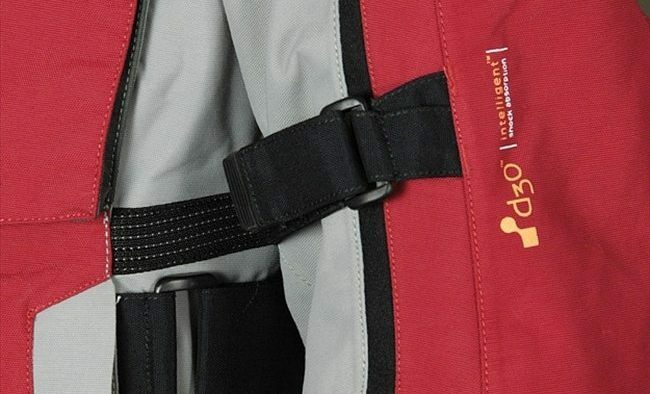 Open the AQUAzip zippers and the vent lines up with an opening in the Teton shell. Riding with the jacket in fall weather, ranging from 50-70 degrees Fahrenheit (10-21 C), in light and heavy rain, fog, morning and evening chill and the rest, the four vents on the Teton can be adjusted to cope. While the Teton probably will not be the best solution in very warm weather, only a mesh or perforated jacket really is, so no complaints here at all. In fact, other than the loss of water-resistance integrity when the vents are open, the fact that the vents actually do allow air to enter the inside of the shell is a much more overwhelming positive. That’s better in my opinion than making the shell 100% water-resistant for 100% of the time. The vast majority of motorcycle riding takes place in a variety of weather conditions that call for venting adjustability rather than ultimate water resistance. 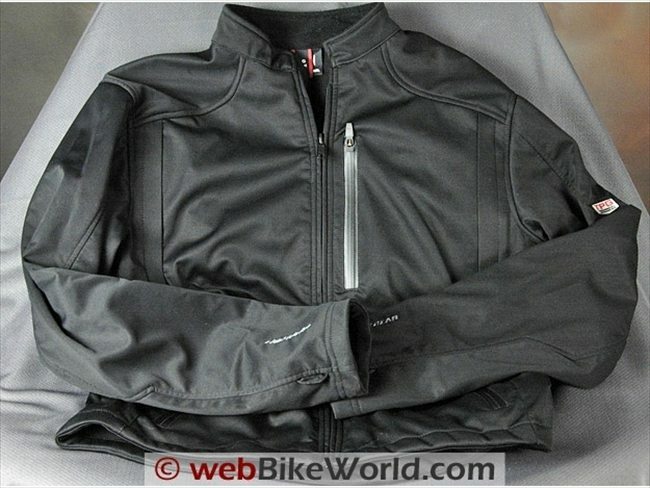 The jacket sleeve has a two-way zipper (see below), which allows the sleeve cuff to be opened for ventilation also. The Teton jacket features the two large chest pockets, covered with the YKK water-resistant zippers. They’re visible in the photos as the black vertical bars on the jacket chest. These are patch pockets and they’re lined, so they’re water-resistant. Hand pockets are also included, they’re nicely hidden just where the red meets the light gray at the lower part of the front of the jacket. These pockets feature a water-resistant lining and use water-resistant YKK zippers also. 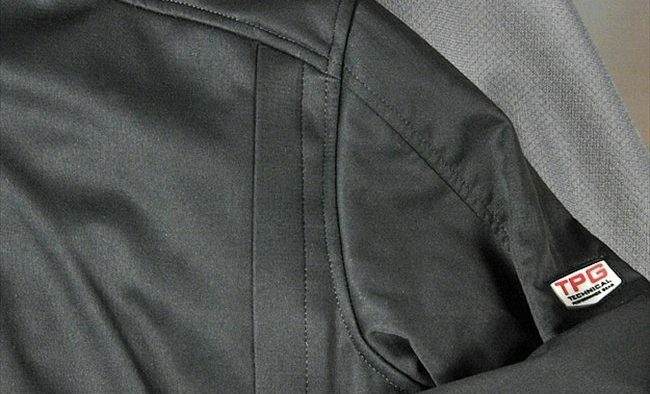 Inside the jacket are two vertical pockets in the placket, also lined with what feels like water-resistant material. The left-hand placket has a wallet pocket just inside the outer flap, so it’s readily accessible by undoing a couple of the snaps. The right-hand placket includes another zippered wallet pocket; this one is inside the main jacket zipper. Inside the jacket on the chest are a cell phone pocket on the left, with a hook-and-loop cover. 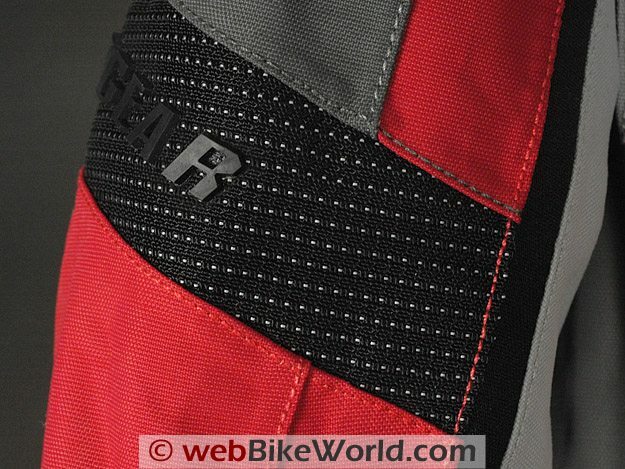 The right side has what Firstgear calls a cargo/map pocket, down at the lower part near the hem. The pockets use YKK zippers. So this is a nice selection of pockets; not too many, but usefully sized and the chest pockets are easily accessible because of the external zippers. I really like placket pockets because that’s where I store my wallet, so that’s a bonus for me. The Tech Liner has two outside hand pockets, an external chest pocket on the left and an inside cell phone pocket. 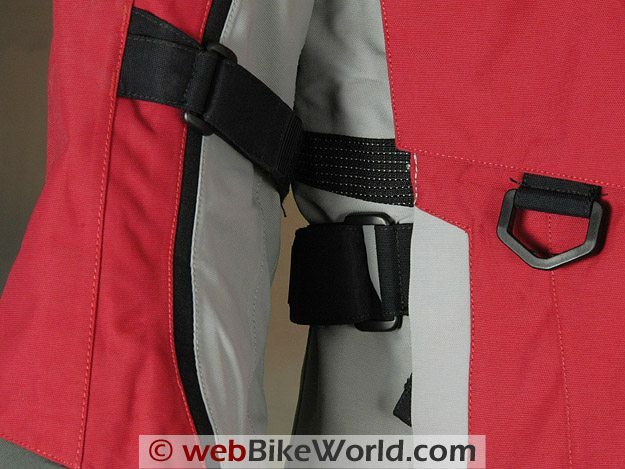 The external pockets use the water-resistant YKK zippers. 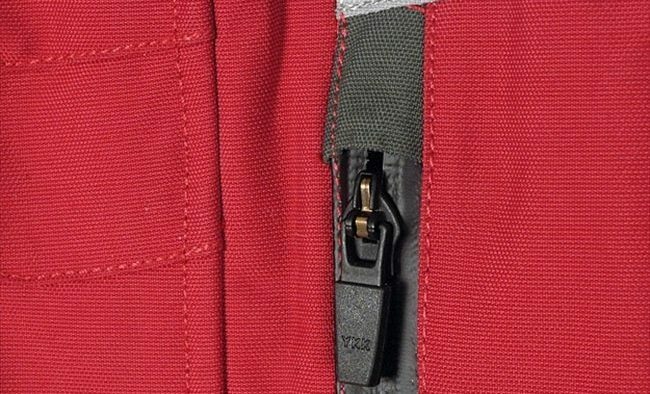 So this is a high level of detail, with the YKK water-resistant zippers and lined pockets and the extra pockets also using the YKK water-resistant zippers in the liner. Many high-end features that do justify the price of the Teton jacket. The Teton jacket and other TPG clothing uses the new d3o protectors, which have been receiving a lot of press recently. d3o is thinner and claimed lighter than the typical armor used in motorcycle jackets, and it certainly gives the Teton jacket its sleeker appearance. It probably does add some comfort, although it is stiffer and harder than I imagined it would be after reading the press reports. The manufacturer claims that the material hardens when moved quickly, which isn’t a new concept in protection. The d3o armor can be formed into different and more pliable shapes than typical hard armor. d3o is certified to EN-1621 Level 1, the lowest of the ratings (more on EN ratings in our review of the Forcefield Pro Sub4 back protector (review). Of course, I haven’t crashed using d3o armor, and even if I did, I’d have no way of comparing it to traditional protectors. However, I’d like to see the data and graphs that show how the d3o armor absorbs energy over time compared to other types of armor and I’d also like to see the CE certification, if there is any. It seems to me that other types of armor might be able to spread the energy over a longer time duration, which is one of the keys to reducing injuries. But in the meantime, we’ll have to take them on their word. “Any protection is 100% better than nothing”, I’ve always said, so if the designers have more styling leeway by using the thinner d3o protectors and the result is that more people are enticed to wearing protective clothing, that would be a benefit. The d3o in the Teton jacket is located in the elbows and shoulders. It’s removable, held in pockets that, at least in the shoulders (I haven’t peeked down into the sleeves) can be moved slightly for best location, because the pockets attach with hook-and-loop. The jacket has a thin, soft back pad in a pocket, so it’s possible that it could be replaced with something more robust, such as a SAS-Tech back protector made for jackets. The Teton jacket has no discernable abrasion-resistant material externally located on the shoulders or elbows, which is one of the reasons the jacket has such a sleek look. Firstgear says the Teton uses a “Kevlar reinforced Teramid underlay” in the shoulders and elbows. Teramid is a Korean-made breathable fabric, and it’s not clear how much Kevlar is used to reinforce the “underlay” and how large it might be or what type of protection it might afford. So between the absence of external abrasion-resistant fabrics, the lightweight d3o protectors and the exposed single stitching, the Teton does seem a bit light on overall crash protection. 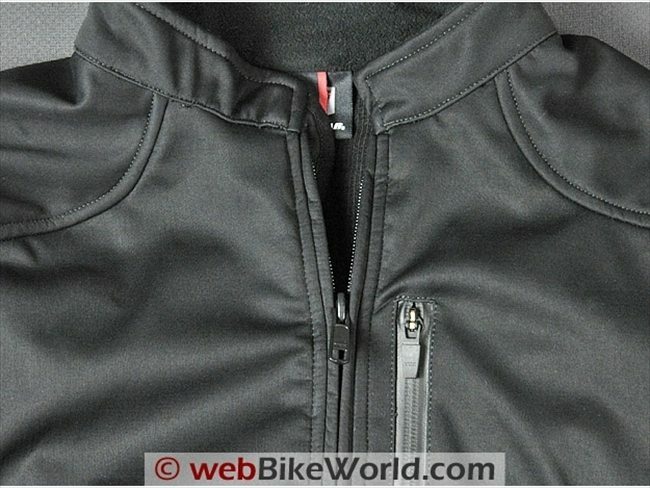 Attachment Zipper: The jacket also has an internal 8″ zipper on a piece of stretch fabric, which allows it to be attached to the Firstgear Escape pants. Sleeves: The sleeves have two sets of adjusters with hook-and-loop (photo below). The adjusters are easy to use, with a grab tab for the hook-and-loop attachment, although there’s no elastic in the mix. However, it’s difficult to believe anyone will have to adjust the sleeves to be narrower than stock. The jacket sleeves have the same very tight fit at the elbow and forearm that we found in the Rainier jacket. With the Tech Liner in the Teton jacket as it would be in cold-weather riding, it’s difficult to bend my arm all the way, even with the adjusters at full slack. I’m not sure why Firstgear is using such a slim arm template in the Teton and Rainier, but potential owners will want to try the jacket to make sure it will fit. This problem is exacerbated when the Basegear is also being worn; in fact, there just isn’t room for layers other than the Basegear and the Tech Liner because the sleeve becomes too tight at the bend. My arms aren’t Popeye-like by any means, measuring only 12″ in circumference just below my elbow, so if this is an issue with me, I’m sure it will be an issue for others. Sleeve Cuffs: The jacket uses a dual-action zipper at the cuff, along with a hook-and-loop adjuster. I discovered that once the cuff is secured with the hook-and-loop, the zipper can be used to release the sleeve, then the hook-and-loop doesn’t have to be touched again. 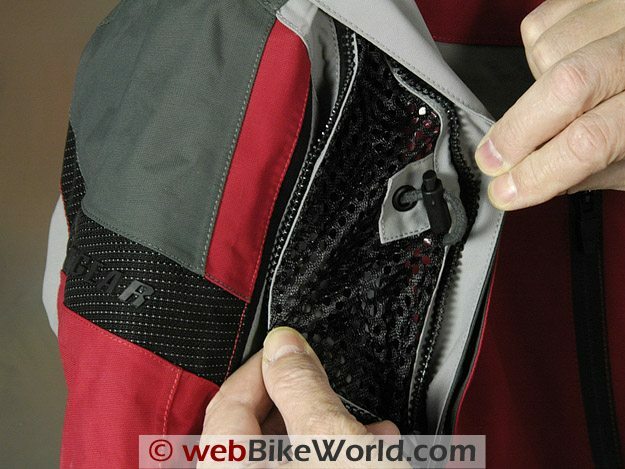 The upper zipper can be lowered to allow air to flow into the sleeve through the attached mesh lining, a nice feature. External D-Ring: The Teton jacket has a hefty D-ring on the outside on the left. The Firstgear photos show the D-ring being used to hold gloves, but it can also be used to hold a flashlight, ID holder, keys, etc. LED Accessory Light: Firstgear sent us an LED accessory light with the Rainier jacket in 2008, and somehow it was lost and we never described it. It’s a special light, like the type used on bicycles, and it slides into a special loop in the material on the back of the jacket. The light can help improve visibility at night or in fog. Special TPG Crash Protection Warranty: How’s this: Firstgear gives a two-year warranty on the TPG clothing to the original owner, along with a special two-year Crash Protection Warranty. 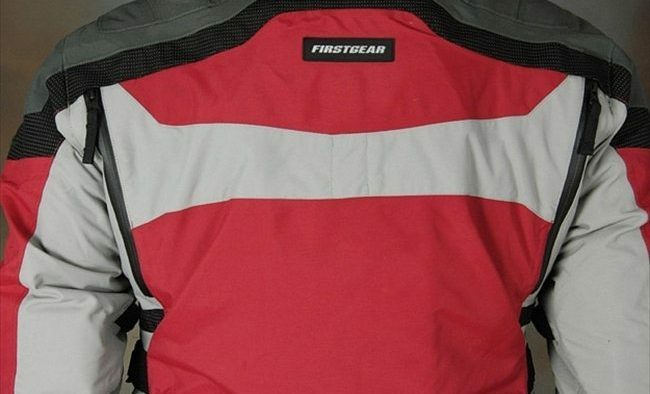 Firstgear will replace the clothing for free, as long as the rider submits a Police report of the accident and feedback on how the item performed. That’s an excellent policy! Colors: The Teton comes in the red shown here, along with a blue and silver. The other colors would replace where you see the red in these photos. The Teton jacket has excellent build quality. The stitches look great, but they’re exposed. Firstgear has come a long way in the last 10 years. Once one of the best-known and most respected brands in the U.S.A., Firstgear bounced between several owners (remember Intersport Fashions West and Fairchild Sports?). The company was kept alive with some very forgettable products for a while. Tucker Rocky came to the rescue in 2005 by taking over complete ownership and responsibility for Firstgear products, but at the time, it wasn’t clear which direction they would take. Firstgear could have become yet another brand name whose market equity was exploited to maximize profit. But the new owners have instead focused on quality and performance and it definitely, positively shows and it’s very impressive. 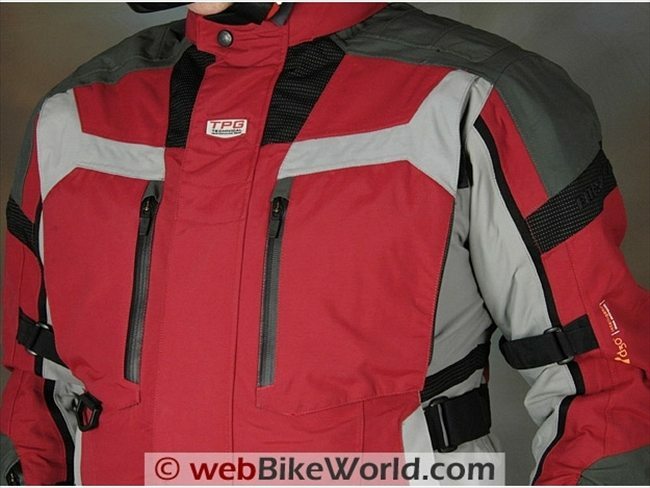 In fact, the Teton TPG jacket is leagues ahead of any other Firstgear product from the past. 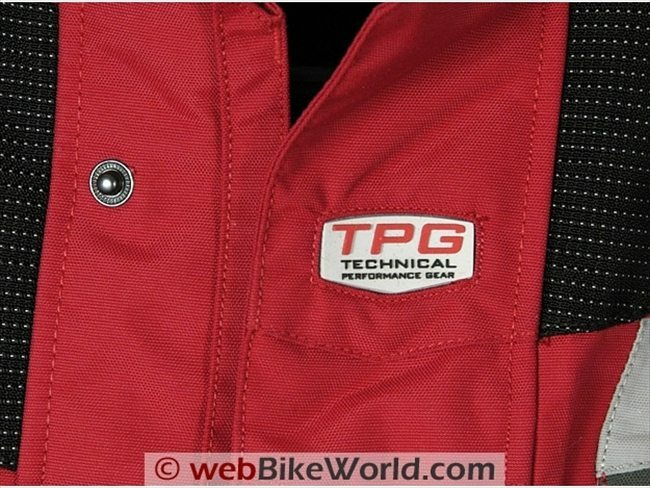 I think we’d have to say that the TPG line at least is the premier contender of U.S.-based motorcycle clothing manufacturers (although like most motorcycle clothing today, the products are made offshore). The combination of features in the Teton jacket, along with the multi-use Tech Liner, make for a comfortable, multi-season jacket. It’s also a big step up from the 2008 version. However, this brings me to the pricing strategy, which is hard to ignore and may be somewhat problematic. The fact remains that $470 is a lot of money for a jacket — and don’t forget, a Basegear top and bottom set adds another $140. Granted, there are some riders who will pay whatever it takes for the best clothing with top-notch technical specifications. Indeed, this price range is where highly knowledgeable, experienced and seasoned riders are looking for leading-edge technology fabrics and safety details. Those would include things like blind stitching, Level 2 or higher SAS-Tech armor in the elbows, shoulders and the back and specialty fabrics like Superfabric or Schoeller Keprotec on the wear points and more. Perhaps the addition of the d3o armor demands a premium? Certainly the use of the RIRI AQUAzip closure does. Also, I’m not totally convinced that the d3o protectors have the performance to demand a premium. It may be thinner and lighter, but it’s not like it disappears in the jacket and it can still be felt when wearing the jacket. A good design using traditional protectors can hide most or all of the bulk of the protectors anyway. I’d argue that the customer paying this much for a jacket would want the best armor money can buy — the same type of protection quality used by motorcycle racers. In situations like this, I use my Rossi test: Would Valentino Rossi wear it? You decide…The addition of the very nice Tech Liner and the warranties do raise the stakes a bit, because the liner not only works, it can be used with other jackets or as street wear. If the Teton jacket came with a real back protector, or if it was priced about $100 cheaper, this would be a no-brainer. 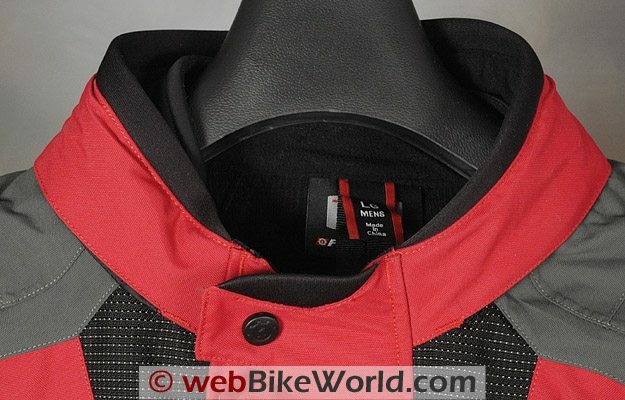 But the Teton’s price is now at the level of competitors who have a reputation for designing and developing the most sophisticated and technical motorcycle clothing in the world. Does the Firstgear brand yet have the gravitas and the track record to demand that premium? The market has, to a certain extent, been making this decision, as the Firstgear Teton can be had for a slightly more reasonable street pricing. Based on observations of Firstgear product evolution over the past several years and what appears to be a solid backing from Tucker Rocky, I wouldn’t be surprised to see Firstgear products considered as equals in that marketplace very soon. But in the meantime, I hope our detailed review of the TPG Teton jacket and the Escape pants will help our readers decide.The Teton is an excellent jacket with outstanding style and it’s obvious that it took a lot of thought. Firstgear also definitely hit their target of making a jacket that is “lighter, less bulky” with “a more comfortable, flexible fit”. And when partnered with the TPG Escape pants, there’s no question that the outfit will be well received by many happy motorcycle riders. Manufacturer: Firstgear USA List Price (2009): $469.95. Basegear $69.95 each. From “A.N.” (6/10): “Thanks for the extensive product reviews. It has been a great help to me and I would like to add my two cents on the 2010 Teton Jacket. I purchased the Teton jacket because I thought it had the most complete feature set of any jacket available. Waterproof exterior without membrane or liner, ample ventilation for hot weather, built in rain hood etc. I ordered a medium (I wear a 40 jacket normally) and the fit was snug with the liner installed and one expedition weight base layer. I am 6’ 2” tall and the sleeve length was perfect. The vents gave me the impression they would not gather air very well but a road test would tell me that much. As I adjusted the vent opening device the left chest vent string kept coming as I pulled it. Apparently, the factory failed to stitch this part in. Probably a fluke so I kept evaluating. The chest vents didn’t appear as if they would scoop much air without the opener. I felt at $417 this jacket needed to be perfect and eventually it fell short in the same department that most of my jackets have fallen short – the neck size. If I am at the top end of the chest size for a medium, shouldn’t the neck fit close? This was the deal breaker for Olympia jackets too. I believe the neck could have fit a 17-18”. From “K.P.” (4/10): “I have serious pros and cons w/ this jacket. First, I bought it online and could not return it. T he good news: I didn’t pay much for it. A. In a downpour, I stayed dry. B. Pockets: Great. there are so many I can forget where I stored things. C. Fit: Large fits my 42″ chest fine, although with additional clothes underneath, it gets a little crowded. D. I like the look. A. The hook and loop on the neck is not just an irritation: It’s painful. To counter this I’ve been forced to sew in protective fabric covers to eliminate the problem. Me w/ a needle and thread is NOT a pretty sight, but I think I’ve located the problem and covered it. Haven’t been on a long ride since this latest venture w/ the needle and thread . B. Below 50 degrees I reach for either my Aerostich fleece liner or heated liner. C. This jacket has a cold, clammy feel to it with the liner only. From “J.B.” (1/10): “Wonderful article on this jacket. I bought a 2009 version, which I bought on sale for $179. I found it to be well made and versatile. It has features I didn’t even know I needed but have turned out to be extremely useful. Like the sleeve pocket where I keep my earplugs and key. 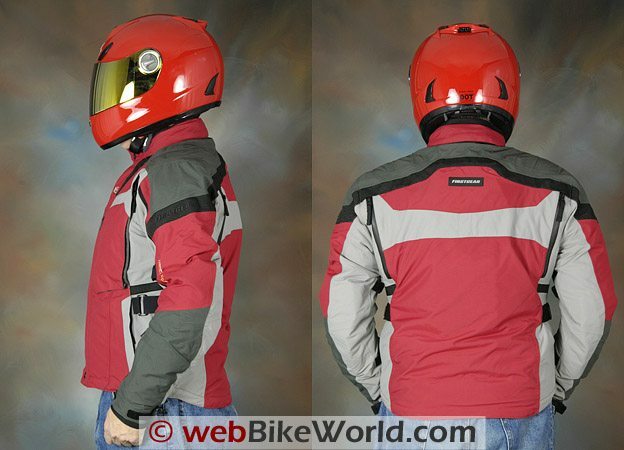 It’s good for me behind a fairing (R1150RT), at highway speeds, down to about 45 F. Below that I add a lightweight fleece underneath, which takes it down to about freezing. That’s at night. On a sunny day or around town you can expect a 5 to 10 degree lower comfort range. Haven’t tried their Basegear but other polypropylene base layers work well. Last night my ride home was an hour in 35 F mixed rain and sleet on Interstates and secondary roads. I arrived warm and perfectly dry. Only my nerves were frazzled; I’m getting too old for that stuff. Cons: I would like to see a better back armor available and a more comfortable collar with a wider range of adjustment. 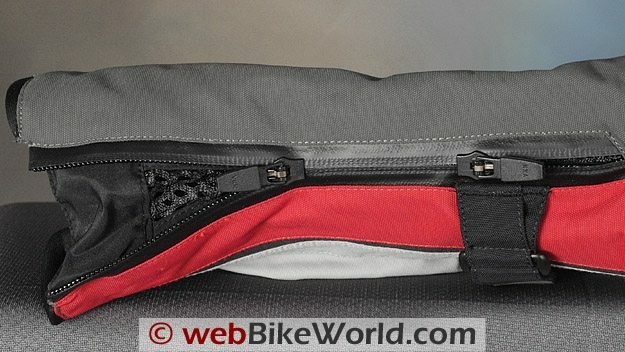 From “G” (12/09): “Dear Editor, first let me thank you and webBikeWorld for the great work, I always watch reviews before buying anything. This time the other way around, I fell in love with the Teton TPG jacket at first sight. I bought it 2 weeks ago and immediately took it to the road, first to the mountains and heavy rain. I have no complaints, it was totally dry in 1 hour after the rain. I just passed a dry cloth over it and sat to the table to enjoy lunch and kept riding for the whole day at 10 Celsius. Very comfortable jacket as well as the inner liner which I wore at all stops very proudly, it is a very good looking soft jacket finally got home and hang the jacket (as well as my escape pant). Next weekend and I took it to the valley, 38 Celsius, no liner, vents open, no complaints. 8 fantastic hours at the end small 45 minute shower, great jacket, great pant. One thing that happened to me when I first wore it, I felt the jacket was very uncomfortable where the D3O protectors were, and I even thought of changing them for some old ones I had. But I took them out and found out that they were placed with the orange part of the d3o facing the interior. So I turned them with the orange facing the outside and the problem was solved, I think somebody does not know how to assemble. From “R.E.” (11/09): “I recently purchased the 2009 model Teton and Escape pants from Firstgear. They are very similar to the 2010 models you recently reviewed. I thought I would share a story about their waterproof-ness, warmth, and unfortunately crash worthiness. I was riding home for 2 hours in 45 degree weather in a fairly heavy rainstorm. I was 100% dry and warm for the first 1.5hrs of the ride. Still not really believing just how good these jacket and pants were. I was on a highway off ramp and my front tire washed out on me at about 30-35mph. I went down and sustained ZERO injuries. No scrapes, no bruises. There is a nickel sized hole at my right elbow, my right hip, my right knee and some scuffing elsewhere on my right side where I slid. The armor was in the right places and the textile material held up very well in my opinion and never came remotely close to wearing through. The outer layer was the only part that was damaged, as I could see the Teramid underlays hadn’t even been touched.